Blue Cat's Triple EQ is an easy to use 3 bands semi-parametric equalizer. It includes a low shelf filter, a high shelf filter and a boost/cut peak filter. Its wide range of gain (+/-40 dB per band) and bandwidth (.01 to 5 Octave) makes it very versatile. The three filters are linked together so that when you change the center frequency or the bandwidth, the three filter parameters are changed accordingly. Statement: First, please download the orginal installation package by clicking the download link. Of course you may also download it from the publisher's website. Using Blue Cat's Triple EQ crack, key, patch, serial number, registration code, keygen is illegal. The download file hosted at publisher website. We do not provide any download link points to Rapidshare, Hotfile, Depositfiles, Mediafire, Filefactory, etc. or obtained from file sharing programs such as Limewire, Kazaa, Imesh, Ares, BearShare, BitTorrent, WinMX etc. Software piracy is theft. 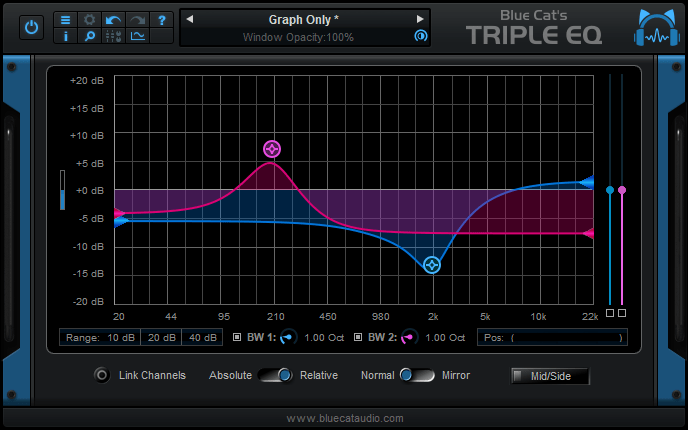 If you like Blue Cat's Triple EQ please buy it.